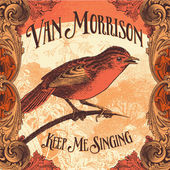 Music Entertainment – The Music Entertainment of the 21st Century!Keep Me Singing - Van Morrison - Music Entertainment - The Music Entertainment of the 21st Century! Sounds like Van Morrison and that can only be a good thing. No one out there right now writes and sings such heart-breaking and achingly beautiful ballads like Van. This is a man who is a poet with the ability to bring his words to another dimension that is, from paper to aural rainbows that soar higher than Heaven.